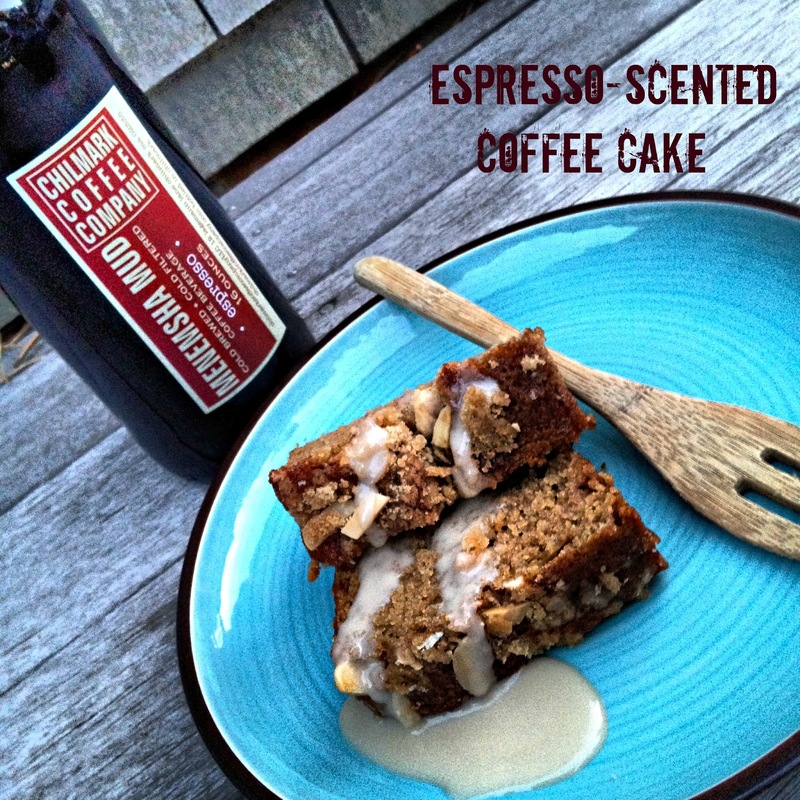 You are here: Home / Desserts / Espresso-Scented Coffee Cake & Giveaway! If you know me, you know about my love for coffee. The moment I wake up, I ache for that first sip of steaming hot, sweetened black coffee. Those minutes while I wait for my percolator to brew, are probably the most difficult minutes to live through in my day. That first sip opens my eyes and tingles run up and down my body, telling it it’s time to start the day! This is cold brewed premium coffee; coffee roasted to exacting profile and taste; ground to a medium coarse grind; steeped for 24 hours in wonderful crystal clear Chilmark water at 48 degrees; filtered twice and bottled in our beautiful flip-top bottles; add ice to an elegant glass and pour over this cold brew. Instead of baking it in a springform pan, I baked it in loaf pans. Worked just as well! 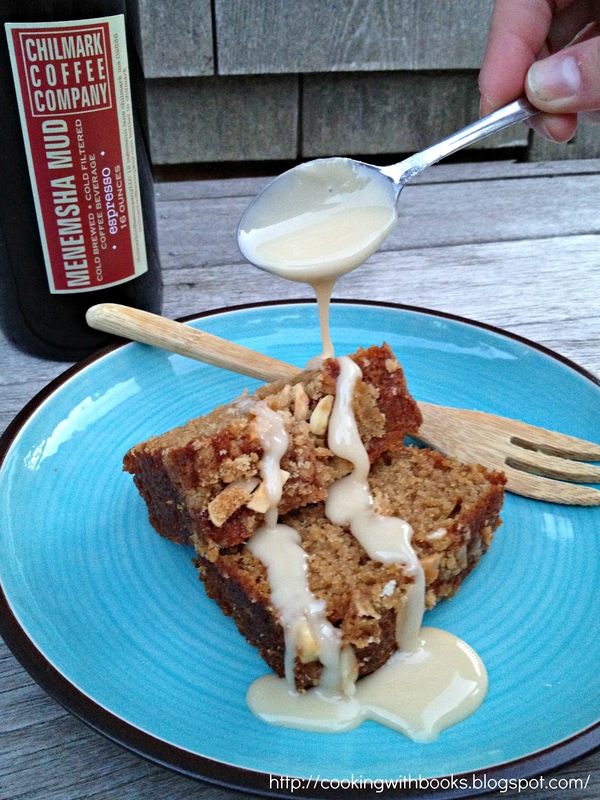 Rather than using instant espresso, I of course used Menemsha Mud Espresso for both the cake and the glaze. For the glaze, I did a mixture of confectioner’s sugar and Menemsha Mud Espresso. Equipment needed: A 9-in/23-cm springform pan and a small ramekin 3 in/7.5 cm in diameter and about 1¾ in/4.5 cm tall (see cooking tip). 1. Arrange a rack at center position and preheat the oven to 350 degrees F/180 degrees C/gas 4. Butter the bottom and sides of the springform pan and then cut a sheet of parchment paper to fit the bottom of the pan. Place the paper in the pan and then butter the paper. Butter the sides and bottom of the ramekin and place it, right-side up, in the center of the pan. 2. In a large bowl, stir together the flour, brown sugar, and cinnamon. Add the diced butter and rub the mixture between your fingers until it resembles coarse crumbs. Remove ¾ cup/115 g to a small bowl and add the chopped pecans; set aside. 3. Add the baking powder, baking soda, and salt to the large bowl with the flour mixture and stir to combine. In a medium bowl, whisk together the buttermilk, egg, dissolved espresso, and vanilla and then stir them into the dry ingredients just until well blended. The batter should be quite thick. 4. Ladle half of the batter into the prepared pan and spread evenly with a spatula. Sprinkle half of the nut mixture over the batter. Repeat with the remaining batter and nut mixture. Place the pan on a rimmed baking sheet and bake until a tester inserted into the area around the ramekin comes out clean, 40 to 45 minutes. 5. Cool the cake to room temperature, about 45 minutes. Then run a sharp knife around the inside edge of the pan to loosen the cake. Run the knife around the outside of the ramekin to loosen it from the cake. Gently remove the ramekin and the sides of the pan. Dust the cake with confectioners’ sugar, drizzle the glaze over the top, and serve. In a medium bowl, whisk together the milk and espresso powder until the espresso has dissolved. Add the cream cheese. With an electric mixer on medium speed, beat the mixture until blended, and then gradually beat in the confectioners’ sugar. The glaze should be smooth and thin enough to drizzle over the coffee cake. If too thick, thin with 1 tsp or more of extra milk. Recipe reprinted from Sunday Brunch by Betty Rosbottom, with permission from Chronicle Books Lusciously moist and lightly infused with espresso, this dense coffee cake is a definite crowd-pleaser. A mixture of brown sugar, toasted pecans, and butter is used as a filling and also as a topping to add extra flavor and texture. An espresso–cream cheese glaze reinforces the coffee theme. The cake is baked in a 9-in/23-cm springform pan with a small ramekin set in the center—an easy alternative if you do not own a baking pan with a removable tube insert. You can make this tempting confection a day ahead, but you’ll need plenty of willpower to resist sneaking a bite! Cooking tip: A 3-in/7.5-cm ramekin works best in this recipe. If you use one wider in diameter the space for the batter will be smaller and as the cake cooks some of it is likely to fall into the ramekin. If you have an angel food pan with a removable bottom or a flat-bottomed tube insert for a 9-in/ 23-cm springform pan, you can use either of those instead. A squeeze bottle with a small opening makes drizzling the glaze over the coffee cake very easy. Comment and tell me what your favorite brunch item is! Visit the Chilmark Coffee online store and tell me what product you love the most! The comments are the official entry, there is no purchase necessary, void where prohibited. US mailing addresses only. One (1) winner will be chosen randomly. Prize will be shipped by Chronicle Books. The contest ends Sunday, July 15th, 2012 at 11:59 pm Eastern time. The winner will be announced on Monday, July 18th, via email and will have 48 hours to respond before a new winner is chosen. Disclaimer: I was provided with a review copy of Sunday Brunch by Betty Rosbottom; opinions are always 100% my own, coffee addictions included! « Top 5 Places for Breakfast on Martha’s Vineyard! Coffee cake is nice for brunch and this one sounds great. I love a hearty quiche or jam and biscuits or pancakes and honey. One of those three will always do the trick! Your coffee talk got me craving a cup, but it is past midnight and clearly not coffee time for me if I ever want to get to sleep! This coffee cake looks absolutes divine, but my favorite brunch item is probably eggs Benedict without the muffin! My favorite brunchy thing is a warm-from-the-oven muffin made with fresh blueberries and an orange on the side. I could eat this everyday til the end of time. Either a really good hash, or crepes or perfect over medium eggs – I can’t decide! There are a few things one of them being a leek spinach bacon quiche. 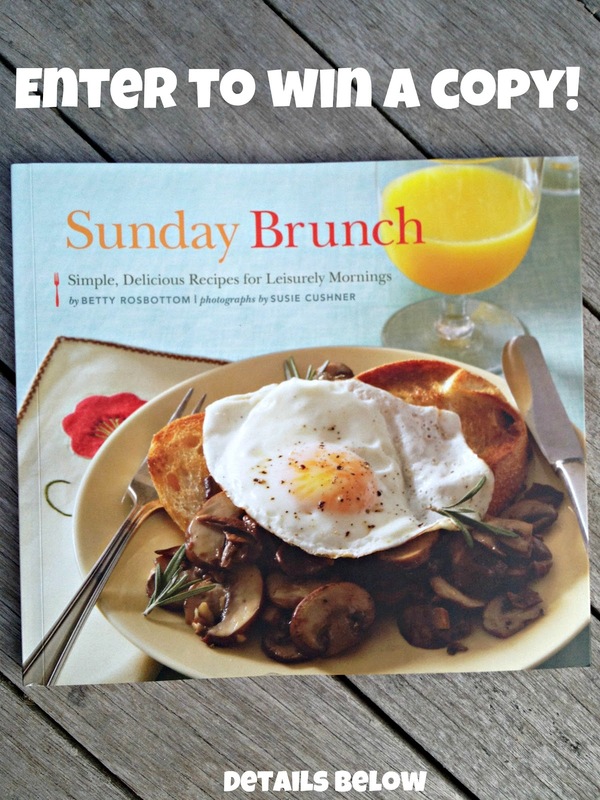 Brunch is my favorite and I would love this book. I love multigrain bread with some jam – and a little egg. Yum. At the Chilmark online store, I think the Costa Rica: La Amistad; Organic, Shade-Grown looks great! My favorite brunch item is, hands down, coffee cake! Partial to quiche myself. Had a wonderful bacon/asparagus one at a local church’s ladies meet up. I like a little bit of everything… Pancakes or crepes with eggs, veggies and a lucious sauce.